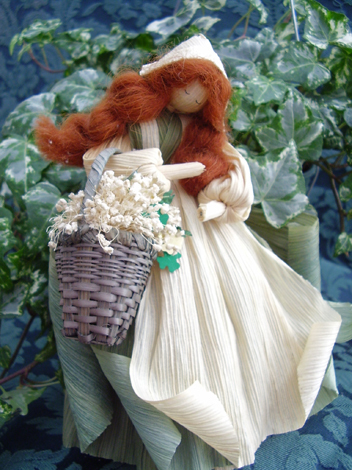 Get ready to celebrate all things Irish by creating this cornhusk doll, the perfect complement to a rustic or shabby vintage tablescape for St. Patrick’s Day. Yes, you’re about to turn these goodies into beauties (Photo: Kathleen Birmingham). 1) Soak the dried cornhusks in warm water to soften them. Don’t rush this process. Please note, you will work the entire doll while the husks are wet. Once they are dry, they will stay in place, and can be easily broken. We want the largest pieces with the narrowest ends for the skirt portion. This will result in the most pleasing appearance when the doll is completed and dried. We want about 8 – 10 pieces of husk for the skirt. We are going to use all green pieces for the skirt except one natural husk that will be the apron. We want a very thin but sturdy piece for the head. I like to use the shiny side out for the face, but the shiny side in for the remainder of the doll. Sleeves (Natural husk) two pieces, one for each side of the arm. Bodice (Green husk)) two pieces that we fold to make the bodice. Apron straps (Natural husk) will be cut or torn from an extra piece of husk. Bonnet (Natural husk) piece about 2 x 3 inches. 3) At this point, dye your skirt and bodice pieces (plus a few extra just in case you need them.) I use regular RIT dye. If you’ve never used it, take the precaution of protecting your clothing and the area around where you’re going to do the dyeing job. 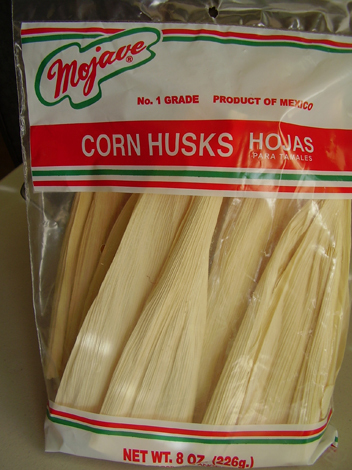 I boil about a quart of water for this many husks. Turn off the heat. Once the stem settles down, add the dye to the water and stir with a stainless steel spoon to blend. Gently immerse the husks into the dye water and use rounded tongs (to prevent making holes in the husks). Once the husks are the color you like, remove from the dye water and rinse them in cool water in the sink until the water runs clear. 4) Arms: Cut a 18 gauge wire between 6 and 7 inches long. Wrap it with a husk to cover, then wrap with 24 – 26 gauge wire in the center. Wrap two times, then twist ends together. Clip close and use pliers to bend wire into the husk to prevent injury as you work on the doll. 5) Take two pieces of husk that are pretty pliable. Gather them around one end of the arm section and secure with wire. Turn the husks inside out and create a balloon effect at the wrist portion. Then, turn the husk right side out and secure both sleeves at the same time in the center of the arms. 6) Head: Gather the narrow end of selected husk and tie off with either wire or thread. Turn husk inside out, and place a 1″ Styrofoam ball into the open pocket you just created. I stick a piece of 3″ long 18 gauge wire to give the neck some stability. Wire the neck shut. 7) Attach arms by making a cross with the neck wire with the finished arms. And wire into place. Wrap a strip of husk around neck to hide where you wired it. 8) Make a little padding with either a cotton ball or some extra husks to form the bodice area. I cover this with husk and wire to the waist. 9) Take two pieces of dyed husk. Place the bodice husk over the shoulder and cross it both in the front and back. Do the same with the other side. Add a strip of natural husk to look like apron straps. Wire in place about where the waist will be. 10) Skirt: The skirt is one of the most important parts of the doll. A natural husk will serve as the apron, then you will need 8 – 10 dyed husks to serve as the skirt. Lay them out as shown. Use the widest and smoothest husks for the skirt. You will be working from the outside of the skirt in, so the first husk you place will be the natural one that creates the apron. Place a green one immediately behind it, and then alternate sides when placing green husks. 11) Once you have wired all the green husks into place, then do a good full round of natural husks to serve as a petticoat. Don’t leave any open spaces as you work around. I like to use the ruffled husks for the petticoat portion of the doll. They don’t work very well for the part of the skirt that shows, but they make for a great under layer. 12) Once you are done, turn the skirt right side out and straighten the husks as well as you can. If your skirt doesn’t work now, it never will. It would be best to cut the wire and start the skirt again if it just doesn’t look right. 13) Trim the skirt to about 5 inches from the waist. A skirt that is too long will not ever look right. Trim now, while it is still damp, and we’ll begin shaping the skirt at this point. Gently tug and position the skirt husks. I like to have the edges of the dress and the apron curl at the edges, so I use a warm, but not hot, curling iron to help me curl the edges. 14) Position the arms as you desire. Tilt her head and bend her at the waist. Leave her at this point to dry overnight so that everything stays in place. Note: Once the doll is dry, you will not be able to reposition anything. Tip: In order to keep the skirt in place while it dries, use wooden spring clothes pins to hold it in place. Cornhusks like to curl when they dry, so you have to be watchful and make sure they curl where you want them to, otherwise, hold them in place with clothespins. Once your doll has dried, you’ll be ready to make her hair, hat and basket. Find out how to complete the rest of this budget-friendly DIY project here. And if you’d love to add some Irish Soda bread to your St. Patrick’s Day spread, click here. This entry was posted in Decor Inspiration and tagged budget-friendly, DIY, doll, Irish, project, rustic, St. Patrick's Day, tablescape, vintage by Flea Market Decor. Bookmark the permalink.